My most recent research published today. 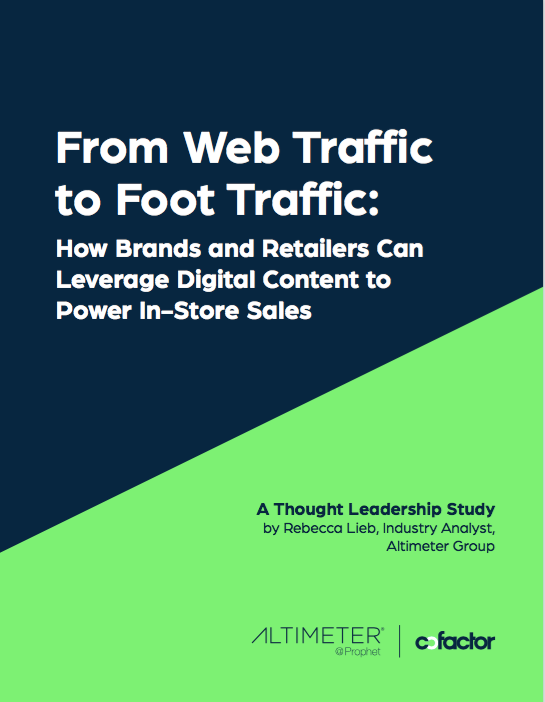 From Web Traffic to Foot Traffic: How Brands & Retailers Can Leverage Digital Content to Power In-Store Sales [PDF download] is the result of a survey of over senior 500 executives at leading national retailers and CPG brands, as well as qualitative interviews with marketing leaders from brands such as PepsiCo, McDonalds, The Home Depot and Staples. Some of my most noteworthy findings indicate that personalized content and localized digital activation must be a priority for brands looking to create fluid cross-channel relevancy with consumers and influence in-store sales. The work contains recommendations for marketers working to tie together the online/offline customer journey and create a seamless omnichannel experience with a strong emphasis on local. Thanks for sharing your reactions! I'll be presenting the findings over the coming weeks at IAB MIXX, Shop.org and other digital marketing and retail-focused conferences.